Smooth, fast and always at zero crossing. Thyristor switches for real time operation in a precise operation. Minimising transients the BEL TS range of thyristor switches are known for their robust design and long working life under demanding RTPFC application environments. For fast compensation needs, demanding near real time, the BEL-TS is an ideal solution to integrate reliable and accurately designed thyristor switches for LT capacitor control. Offered with a fast operating APFC-regulator like the BLT CMT, a very advanced “high speed” solution can be realized. 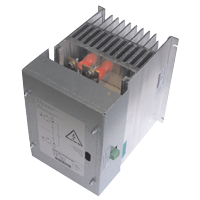 The BEL- TS is available for models rated for 25kVAR steps upto 100kVAR capacitor step sizes. Wide range of copper and aluminium core reactors for detuned applications.